FGMF, Frentes, Beatriz Meyer, Yuri Vital, Rodrigo Cerviño Lopez, Metro arquitetura+Juliano Dubeux, and Lucas Kanyó belong to the latest generation of Brazilian architects  a generation that keeps quality in mind as it responds in its own way to the challenges of Brazilian reality. In Brazil there is a fairly sizeable gap between the overwhelming Modernist tradition and the lions share of contemporary architectural production. On the one hand, most architects still design in the slipstream of the two Pritzker Prize winners, still active at 80 and 100 years old; and the figureheads of the golden age of Brazilian architecture still form the core of many an architectural debate and exhibition. In the meantime, the current explosive growth of cities is, almost without exception, the work of property developers and commercial architecture firms. The result is a monotonous, sprawling mass of Neoclassical residential buildings and glass office towers. Particularly in São Paulo, amazement at the citys beauty has given way to awe of its size. The following selection includes some of the young offices that address the challenges of Brazils reality in different ways by producing topical and innovative projects as they succeed in adopting positions within this situation while, at the same time, keeping in mind the quality of the examples of the masters. Since its founding in 2000, the office of FGMF has won many prizes, among them an honourable mention from the IAB (the professional association of architects in Brazil) in 2008 for its most recent project, Casa Grelha, or the grid house. This villa is located in a hilly landscape on a 22-ha site covered for the most part with protected rainforest. The house consists of a number of independent living units inserted into a wooden grid of 5.5-x-5.5-x-3 m that hangs above a small valley. The 2000-m2 timber grid is wedged into the hill walls with the help of a number of concrete columns and open-frame girders in weathering steel. This solution enabled the architects to allow the valley to extend almost untouched beneath the living spaces. 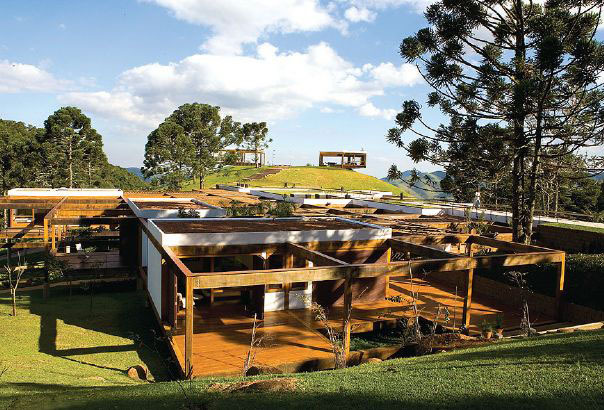 Trees protrude through openings in the grid, and both hill walls are connected to each other at roof level by roof gardens, a path, and water surfaces. A number of subsidiary buildings are, just like the supporting walls that hold up the grid, made of local stone. Frentes is a São Paulo-based collaboration between José Alves and Juliana Corradini. The office takes part very frequently, and often successfully, in competitions, and designed the winning proposal in the Novo Elevado competition for the 2.7-km-long raised motorway that cuts right through the heart of São Paulo. 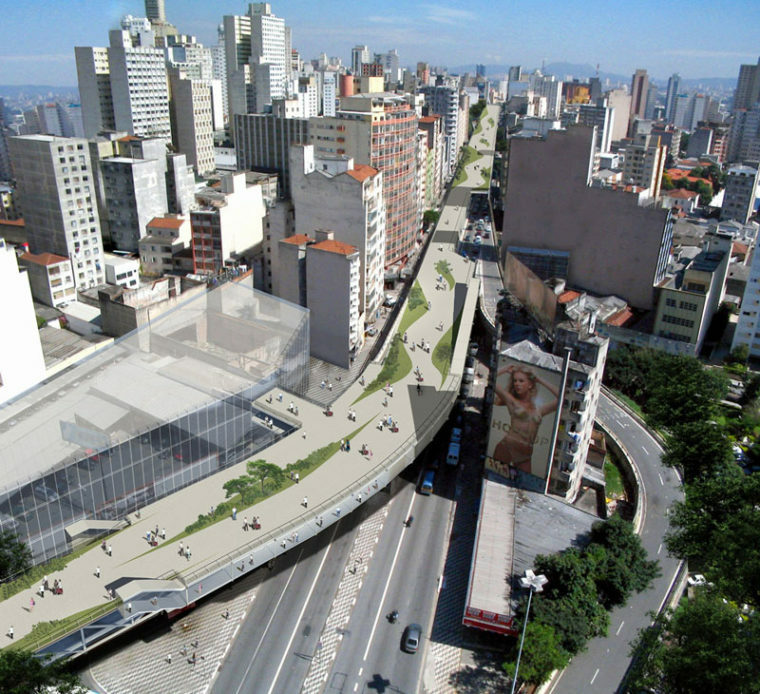 Rather than demolish the viaduct or elevate it to the status of  useless  icon of the ruthless urban-design interventions, the office opted for a more realistic approach by proposing a linear strip of park as a second layer on top of the existing structure. This not only strongly reduces noise nuisance from the tunnelled motorway but also renews the relation between the road and the blocks of flats often only metres away. Located within the park strip are various supporting functions, and entry points in the form of public buildings are located at strategic points. The tunnel walls form galleries that can be let if so desired. 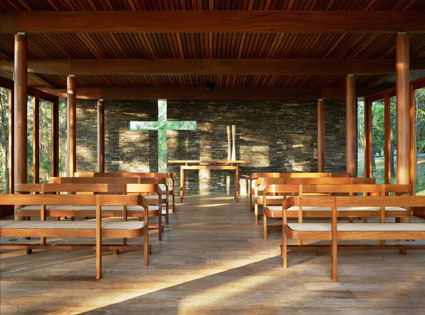 The chapel  which earned Beatriz Meyer the young architects prize in 2007  is located on an estate in Tatuí, a town 150 kilometres from São Paulo. The careful detailing contributes to the feeling that time seems to stand still here amongst the trees. The big inclined roof and the timber columns guide the visitor to the rear wall of stone (pedra ferrugem) from which a cross is cut to reveal the green surroundings. During the daytime there is almost no separation between the chapel and the surrounding pine-trees because of the round timber columns and the big glass façades that, in addition, can be opened fully. At night, spots integrated into the demolition-timber floor illuminate the columns from below and make the small pavilion glow in the forest setting. 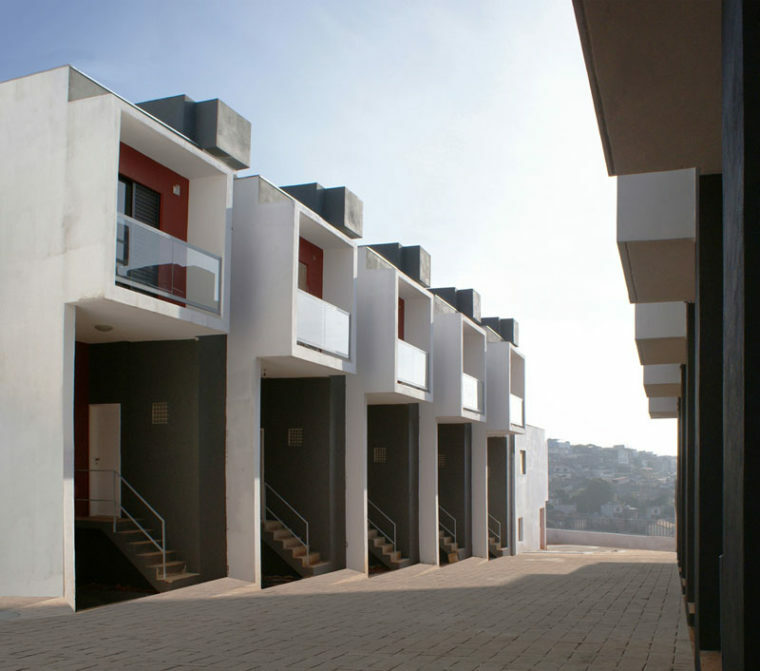 With the Box House residential complex, Yuti Vital proves that there are alternatives to the standardised public housing that is rising up on a huge scale in the outer districts of Brazilian cities. In contrast to the customary typology of low-rise gallery-access blocks of flats, these dwellings are ground-accessed. Organising the house plans vertically meant that the required high density could be maintained without increasing the costs. The irregular form of the location and the height difference ensure the stepped form, both in plan and section, of the urban layout. This is accentuated by the protruding white-painted balconies of the bedroom level, which also shelter the entrances. Each dwelling has a usable floor area of 46 m2, but the clever plan makes it feel spacious. Beneath each dwelling is a half-sunken parking garage. As a result, the hard-surface enclosed street and the spectacular view remain unobstructed. 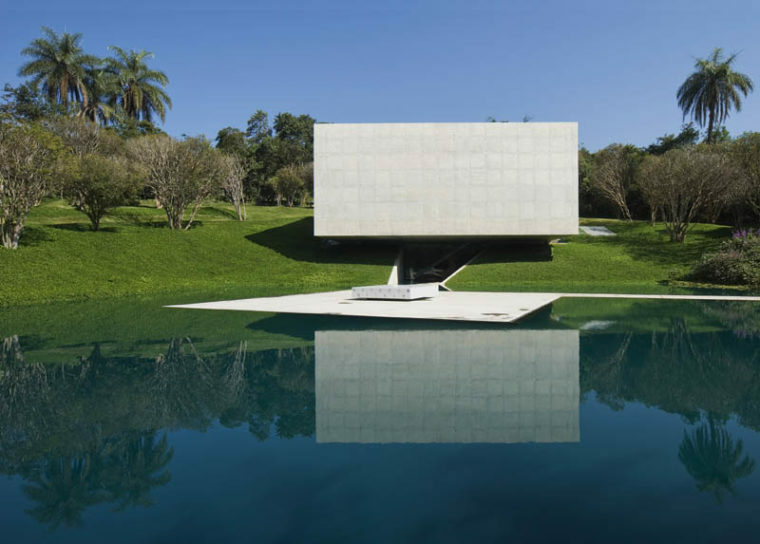 The gallery lies on the extensive grounds of the Inhotim open-air art centre in the small town of Brumadinho in Minas Gerais. The pavilion is designed for two artworks by Rio de Janeiro artist Adriana Varejão, for whom Rodrigo Cerviño Lopez previously designed a studio. As the gallery was taking shape, Varejão made another four artworks inspired by the spaces of the building. The pavilion engages in a direct dialogue with both the surroundings and the artworks for which it is designed. On one side it is buried into the hill, while on the other side it extends over the adjoining lake. On the ground floor the lake flows through in the closed volume, while a pier extends from the building to the middle of the lake. The roof of the building, located at park level, offers a view of the lake. The interior is organised along a spiral-formed route that winds around the artworks in the form of ramps and a centrally placed stairs. 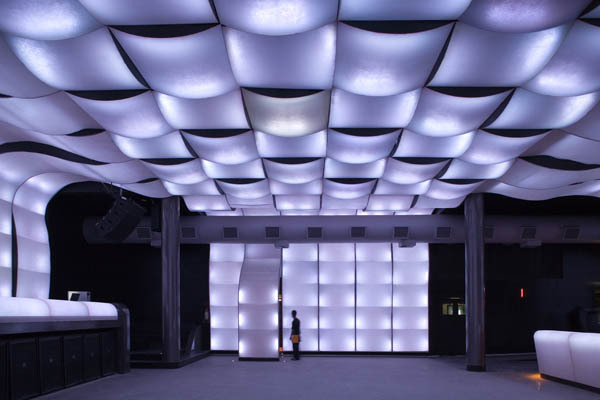 December 2006 saw the opening of Club Nox, designed by Metro Arquitetura in collaboration with Juliano Dubeux. The clients, three young entrepreneurs, among them two DJs, wanted a club that could compete with the hippest clubs in Europe and the US. The site they chose was on one of the busiest streets in Recife, a tourist city of over a million inhabitants on the Brazils northern coast. The building takes the form of a weathered-steel monolith with a mat-glass structure. At night, light seems to escape in alternating colours from this structure. Light is also an important element inside. A membrane of broadly woven strips of fibreglass that change colour thanks to LEDs surrounds the dance floor. A white lounge zone with terrace and roof garden is located in the mat-glass structure on the roof. Great variety is the hallmark of the work of Brasilia-educated Lucas Kanyó. In a short space of time he has amassed a multidisciplinary portfolio that includes not only buildings, interiors and exhibitions but also scenarios. He is currently one of the most sought-after designers in the São Paulo fashion world, with projects such as shops for fashion designer Alexandre Herchcovitch, the clothing label Taglicher, and Canarinho, the 100-percent Brazilian division of Nike. For this label Kanyó developed a pop-up shop, based on the street art in São Paulo and on the Brazilian way of life. 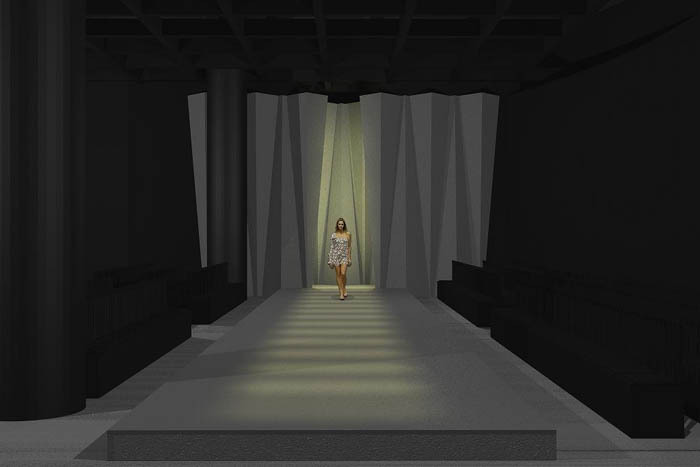 He designed the set for fashion designer Reinaldo Lourenços fashion show during the São Paulo Fashion Week in January 2009. The catwalk design was based on Lourenços winter collection entitled Art-deco. Inspiration for the set came from early 20th-century design and the film Metropolis. Events that focus on Brazilian culture are being held at various locations around Rotterdam from May 30 to August 23 under the title Brazil Contemporary. On show at the NAi, for example, is the exhibition Round Trip Sao Paulo. See the special website for the full programme.